One of the nicer, smaller German labels is Happy Zloty Records, who have a small catalogue of ten releases so far, which hoover on the borders of improvisation, and each release comes in a nicely silk-screened cover. On the ten releases, the latest four are all split LP's, of which the latest contains music by Ensemble Sondarc on one side and Marcel Türkowsky on the other. Ensemble Sondarc is a group of six contra bass players, living all over Germany, and of which only Jürgen Morgenstern and Johannes Frisch rang a bell here. On this recording they team up with the leader of Zeitkratzer Ensemble, Reinhold Friedl, who plays the organ of the Erlöserkirche in Hannover, Germany. The recording is from 2002, but still sounds as exciting today as it might have been back then. Each of the bass players is in total control of their instrument, improvising in an extraordinary way, with the church organ being the central player, even when Friedl plays his notes carefully. Only one outburst in the piece, but that keeps the tension very well present. A great, powerful piece of improvised music. 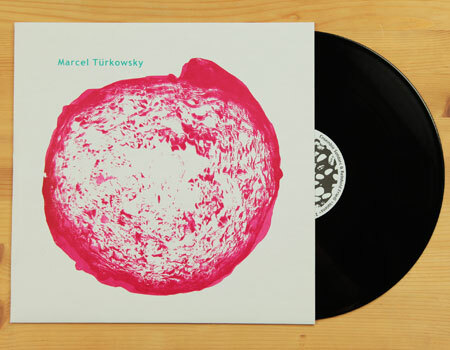 On the other side we find Marcel Türkowsky, who in the past worked together with F.S. Blumm, Ignaz Schick, Andrew Cvar and Guido Moebius, among others. His solo 'Tin Thin Tape Music' was recorded live in two Berlin places 'Kule' and 'Ausland' and Türkowsky uses an organ, walkman, four track, loop machine, delay, big muff and no less than twenty-two cassettes of sound diaries made in Berlin and Paris. This is entirely different than that of the other side. Loud, dirty drones played over a bunch of fuzzy sound cassettes, with all sorts of obscure sounds stored on them. Sometimes things get softer or operates in a more collage kind of way. It's however quite nice music, despite me saying things like 'loud and dirty' and 'fuzzy'. Maybe at times a bit too haphazard put together, but it breaks with many traditions, such as improvisation and drone music, and that is always a good thing. Türkowsky tries and finds his own ways.